The other day while I was grocery shopping, I dropped my Treo 650 and bricked it. It would power up and the touch-screen was responsive, but the keyboard wasn’t. Sad, but not defeated, I decided to try and fix it myself since it was bricked anyway. But, it’s secured with Torx T5 screws and I haven’t found a good source for smaller Torx bits. I already have drivers as small as T6, but where could I get a T5 bit? Of course there’s bound to be plenty of online shopping sites where I could order one, but I wanted immediate gratification–plus, I needed to see if my phone was truly unusable, in which case I’d need to go and get a replacement right away. 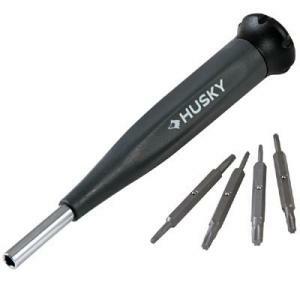 Luckily, I discovered that Home Depot carries the Husky 8-in-1 Precision Screwdriver, which has 4 double-sided bits ranging of sizes T4, T5, T6, T7, T8, T9, T10 and T15, all for $5.97! I drove down to my local Home Depot and picked one up, got home and took my Treo apart. It turns out that the lower-right pad under the right-hand shift button on the keyboard PCB was permanently depressed. I’d carefully lifted it with a pair of precision tweezers and popped it back up, exercised it a few times and closed the Treo back up. The keyboard was working once again and I had a usable phone! However, if I weren’t so lucky, apparently Cellular Nationwide Network, a company based out of Hong Kong, is selling a Treo 650 replacement keyboard PCB for $9.99. I have no idea what the shipping costs from HK to the US are, though. I’m just glad I was able to get my Treo working again! I really didn’t want to have to spend money to replace it right now. If this helped you out with your own Treo repair, I’m glad. Feel free to let me know in the comments below–or, ask any questions you have and I might be able to answer and help you out.